by PaulEMoz in "Burnout Revenge", "Criterion", "XBox 360", "crash", "racing", "road rage"
You know how there are occasionally times when you just have to play a certain game? I've had that lately. In fact, I've had a hankering for some Burnout. Not Paradise, though... fine game though it is... but one of the more old-school efforts. 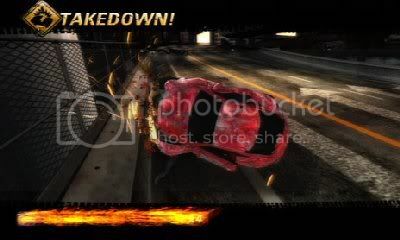 I can't be bothered to go hooking up old systems to scratch this itch, though, so that left me with Burnout Revenge. Pity I didn't own it... but when you have that itch, you have to spend, and I popped out and (eventually) found a pre-owned copy. Aaaahhhh... I could almost feel the relief on the bus journey home. The funny thing is, I had Burnout Revenge on the PS2, and didn't really like it. I was kindly sent it for review purposes by a lad at EA Canada, but I was so on the fence about it that I never completed the review. That's one of the problems with getting free stuff to review... it makes you feel bad if you don't like the game. Spend your own money, and you can say what you like. Anyway, sorry, EA Games lad. Ahhh... the open road. Well, there's that car in the distance, but you can just ram that out of the way. 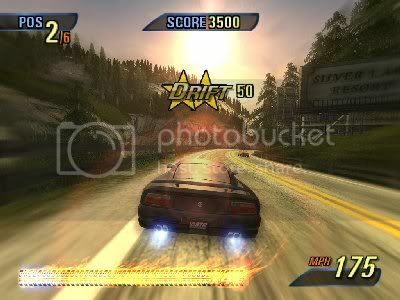 My main problem with Burnout Revenge was the racing. There have been a few problems with Burnout games over time... but I think I feel a feature coming on to discuss those. With Burnout Revenge, the problem lay with the introduction of "traffic checking". What did this mean? It meant that you could basically drive straight through most vehicles that were travelling in the same direction as you. It removed a lot of the skill from driving, and turned Burnout into Advanced Turbo Snowplough Simulator. That's what you want to see... cars wrecked by your own fair hand. Still, I bought it. The other modes are fun, and I was just in the mood to ram some cars and figured even the traffic checking wouldn't be too annoying. And I was right... I found myself enjoying the whole package, this time. The racing is still a bit silly with all the ramming going on, but it was just what I fancied. Road Rage is still great, although it seems much harder for some reason. Crash Mode is better than it was in Takedown... from what I've played of it, it seems that they've removed stupid stuff like the heartbreakers, which is definitely a good thing. So, my itch is truly scratched. I've even enjoyed the two-player game this time around... Aidan was only four when I last played it and wasn't really up to the challenge. Five years on and he's a worthy adversary, and we battled to an epic 5-4 victory... in my favour. There will be much more of this in days and weeks to come. Good stuff.